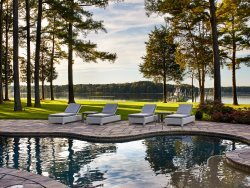 Tricefields is an exceptionally private waterfront property featuring a four bedroom Tidewater Colonial home. Located within walking/cycling distance to downtown St. Michaels, Tricefields offers the best of both the town and the country. You'll enjoy the flow of the traditional floor plan with large gathering rooms. The kitchen is gourmet with plenty of space for creating culinary perfections, all of which can be enjoyed inside or out with ample seating for your entire party. You'll enjoy quiet moments inside among comfortable furnishings and tasteful decorations. Outside is an oasis of tranquility with opportunities to relax on the waterfront or cool off in your private pool. The grounds are vast and very private. Although you may choose never to leave the comforts of Tricefields, you are only minutes away from the shops, restaurants and waterfront haunts of downtown St. Michaels. Fireplaces: Fireplace in kitchen is wood-burning. Firewood is not provided. Please note that fireplace in living room is not usable.